1) Beat cake mix,water,oil and eggs in a bowl at medium speed.Make sure that all the ingredients are mixed well. 2) Preheat the oven to 350 F .
3) Grease the bottom and sides of the baking pan with oil and spread some all purpose flour on it. 4) Pour the batter into the pan and bake until a stick which is inserted in the center part of the cake comes out clean.It will take around 20 – 30 minutes. 5) Cool the Cake before removing from the pan. 6) Mix 2 tbsps of Decorator Icing and 3 tbsps Chocolate Syrup in another pan for decorating the cake. 7) Cut the four sides of the cake and dip in the icing mix and place it over the center portion of the cake. Also spread the Icing on top and sides of the cake . 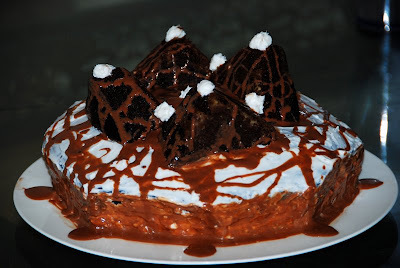 8) Pour some icing mix into the cone and decorate the cake. :- You can decorate the cake with your own ideas.